PROFITS AT RUPERT Murdoch’s News Corporation more than halved at the start of the year as his news business continued to act as a drag on the company. The media conglomerate, which publishes newspapers including the Sun, the Times and the Wall Street Journal, said its ad revenues were down 12% after “weakness in the print advertising market”. Its income from circulation and subscriptions was also down over the three months when compared to the same period in 2014. In Ireland, the circulation for News Corp’s Irish Sun has dropped almost 7% from an average 63,535 daily copies for the second half of 2013 to 59,119 from July to December last year. Circulation figures for the Sunday Times have fallen by a similar share from 92,643 to 86,059 copies over the year. News Corp also continues to feel the effects of the News of the World phone hacking scandal, which cost the company $42 million in fees and charges in the nine months to the end of March. Those “UK newspaper matters” had already set it back $470 million in total expenses, including some $36 million paid out in civil settlements, between July 2010 and June last year. The company said its net profits were down 52% to $23 million for the quarter after the company recorded further losses from its struggling digital education arm. The overall drop in profits came despite better performance from its book publishing business, which includes HarperCollins and Harlequin, because of ”strong backlist sales … resulting from the continued popularity of American Sniper”. The Chris Kyle autobiography was released as a film starring Bradley Cooper earlier this year. 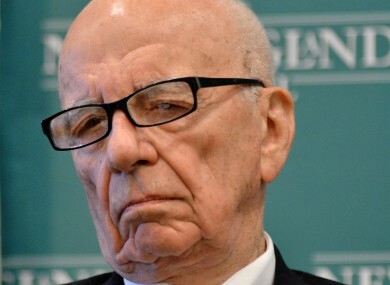 Email “Rupert Murdoch’s newspaper empire has hit the wall hard”. Feedback on “Rupert Murdoch’s newspaper empire has hit the wall hard”.